Onychomycosis, or fungal nail infection, is a common problem and is difficult to treat, requiring several months. Topical medical treatment is often ineffective because the microorganisms which cause the problem become resistant to any medicine: these topical treatments themselves can cause hyperkeratosis ( blocked pores ) underneath the nail. Onchomycosis is a benign affliction, caused by a fungal infection (such as athlete’s foot); which nonetheless leads to complications such as making it painful to put shoes on, or the fungal infection spreading to other parts of the body, or to other people, and causing serious problems, such as ulcers and reinfection amongst diabetics. Before the laser treatment, you must do a fungal test at a specialised laboratory to confirm any diagnosis ( 50% of nail diseases are not due to fungal infection ). A podiatrist must prepare the nail, reducing its thickness to 1mm to allow the laser energy to reach the tissue under the nail. The laser beam, passing over the nail, causes the fungus temperature to rise, destroying the fungus without damaging surrounding healthy tissue. The nail will grow back normally. This treatment is painless, but the patient might feel a faint sensation of heat. All the nails are treated, as well the surrounding skin and in-between the toes. This will get rid of any lurking ‘sub-clinical’ infection ( an infection which has not yet developed any clinically recognised signs ) which could cause reinfection. 1-3 sessions are required, with 1 or 2 weeks in between each session. Apply an anti-fungal treatment twice a day for two weeks to the skin and the sides of the feet; after two weeks, you must apply the cream once a day for a further two months. In the evening, spray the inside of your shoes with an anti-fungal spray. Avoid walking barefoot in public spaces ( e.g. swimming pools, sports halls and in the sauna ). Disinfect your nail care kit ( scissors, clippers etc ). 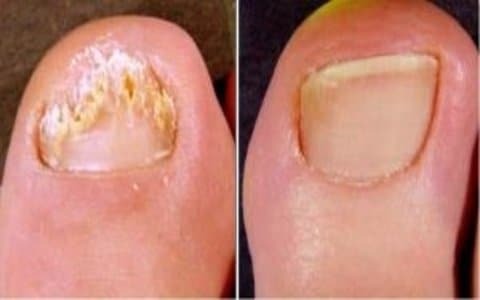 Cut out factors which encourage fungal infection ( heat and moisture, heavy sweating, constant wear of closed-toe shoes, smoking, biting nails ). There is no down time, and it is possible to wear shoes straight away. Skin around the treated area will be red and slightly puffy for 24 hours. 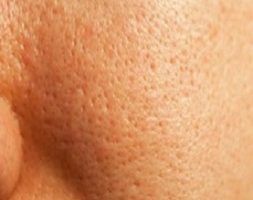 – Fungal infection cure rate of 85.5 %. 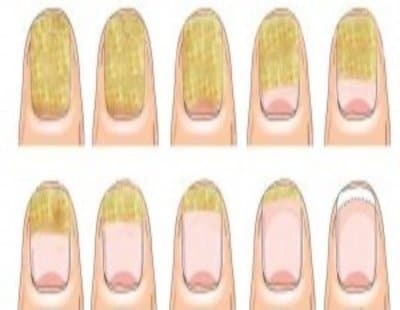 – The nail will gradually clear-up; it takes 4-6 months for healthy finger nail regrowth and 9-12 months for a toe-nail, as nails grow at an average rate of 1mm per month. To treat my toenail mycosis, Doctor Romano offered laser sessions (4 sessions), the results were fast. Thank you Doctor. In the summer, I didn’t dare wear sandals anymore because of my toenail mycosis. I thank Doctor Romano for finding a solution to treat them. I am very satisfied with the result. I consulted Doctor Romano for feet mycosis, she did laser sessions. I can finally stay barefoot in the house. Very professional doctor. I am very satisfied with the treatment done by Doctor Romano to treat my mycosis, I am no longer neurotic about my feet. Thanks again. One nail 120€ each session, it needs 4 sessions.